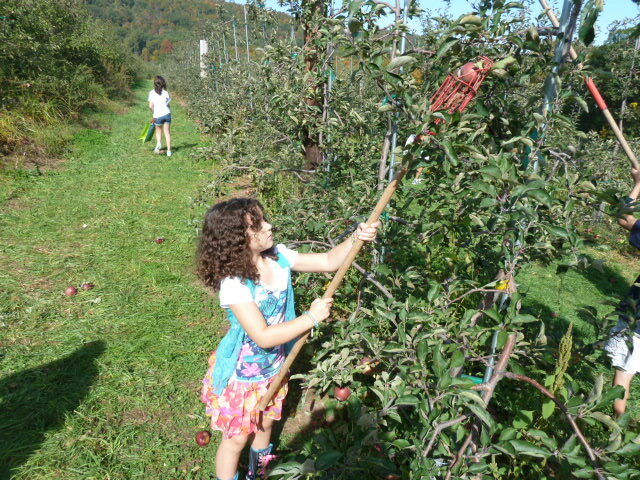 Papa took the girls apple picking yesterday. I was working while trying to stay conscious in bed, sick as a dog for the first time in a couple of years. I had a flu shot last Thursday and this is the second time I’ve become sick within a day or two of receiving the immunization. Am I paranoid or is there something to that rather peculiar timing? Anyway, while I was trying to breathe, the girls had off from school and my husband took them on this little adventure. Turns out they were a couple of weeks too late, as most of the apples had already been picked. But they still managed to bring home some cute little specimens and they were able to spend a beautiful summer-like October day enjoying a fall tradition. If we get our act together next year, maybe I’ll be able to join in, too.